Foresters recognize that it is necessary to take climatic variation into account to predict the growth of forests and conditions that make them vulnerable to natural disturbances. Scientists have constructed computer simulations models to address this challenge. 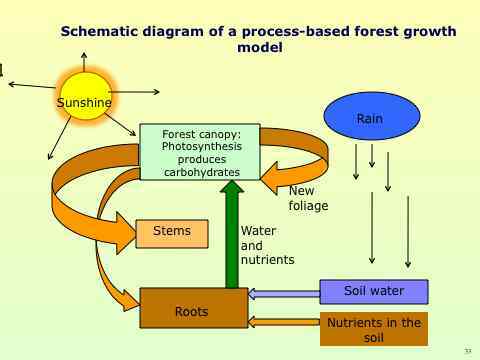 Such models require information on seasonal and interannual changes in weather, as well as how much water and nutrients are available from the soil, as these factors combine to impose limitations on photosynthesis, and ultimately, on how growth is distributed above- and belowground (see diagram). If only sunlight limits production, growth increase linearly as the canopy of leaves intercepts and absorbs more light. Monthly mean maximum and minimum temperature data are sufficient, with knowledge of a site's location, to derive good estimates of incident solar radiation, frequency of frost, and humidity deficit of the air, which, along with monthly precipitation, are the essential climate variables required to drive the model. More detailed background material as well as a spatial version of the model programmed in C++ can be obtained from the 3-PG website located at the University of British Columbia, which was established by Dr. Nicholas C. Coops.